Many remember 19 November as the day that Amazon launched the Kindle Store in 2007, but that wasn't their first attempt to sell ebooks. It was their 4th ebookstore (at least), and the first one was launched on this date in the year 2000. The above screenshot was found via the Internet Archive's Wayback Machine, and dates to April 2001. That puts it about 6 months after the launch, and it's the closest I could get. 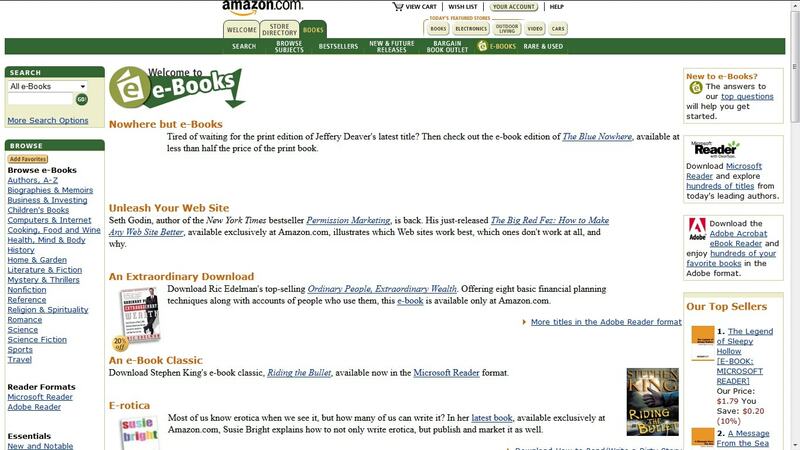 Amazon launched that ebookstore in part because the year 2000 was the tail end of the dot-com bubble, and also in part because of a successful ebook promotion that happened earlier in the year. Stephen King is well-known for experimenting with new ideas, and in March 2000 he arranged to sell a novella as an ebook. At the time he said he was "curious to see what sort of response there is and whether or not this is the future." Riding the Bullet was given away for free on some sites (including B&N, Amazon) and sold for $2.50 on others. It was reportedly downloaded over 400,000 times in the first 24 hours after it was released on 14 March, making this the first ebook best-seller ever. In fact, it was so successful that downloaders inadvertently succeeded in crashing Adobe's servers. With that kind of a popular response it's no surprise that Amazon, B&N, and many other retailers got into ebooks. Those were the early years of Amazon, when they were still trying to find the best way to sell ebooks, and at times their customer support was a dismal mess. I can recall an incident in 2007 in which one reader was told tough luck when his PDFs wouldn't open after he upgraded to Adobe Reader 8. That incident, which would be unimaginable now, was the final straw that made me vehemently anti-DRM. Amazon killed that first ebookstore in February or March 2006, about 21 months before the launch of the Kindle Store, but that doesn't mean that they had stopped selling ebooks during the interregnum. Amazon's second ebookstore,which sold e-Documents, launched in the Summer of 2001 (Wayback Machine) and was still around at the time the Kindle Store launched in November 2007. And that's not all. Amazon had acquired Mobipocket in 2005, and while that ebook startup was quietly being used as a source for tech needed to build the Kindle Store it was still operating and Amazon was sending customers there. But wait, there's more. Amazon's third ebookstore, Amazon Shorts, also launched in 2005. This was a basic ebookstore that sold text files (short stories, usually). According to press accounts it continued to operate even after the Kindle Store launched in 2007, and was finally shut down in July 2010 - about 6 months before Amazon launched the Kindle Single Store. The reason I am bringing up all these other content stores is that I want to show you just how many different experiments were tried by Amazon. Much is going to be said 5 days from now about Amazon changing everything with the launch of the Kindle Store, but almost no one is going to note that Amazon had already struck out 3 times before the Kindle Store was a success. The Kindle Store was built based on what Amazon learned from their less successful ebook projects, and that is part of the reason why it solved so many of the problems that existed in the ebook market at that time. For example, take that problem with the customer losing access to his ebooks. One thing that Amazon learned from that first ebookstore (besides how to provide better CS) was that they had to control the DRM themselves, rather than rely on a third party. This enabled Amazon to better control the customer's experience, winning over more people. Amazon won the ebook market on the back of 7 years of investment. With that in mind it's no wonder that everyone is just now catching up, 6 years later. I wish all the Amazon bashed would think about what they were doing 13 years ago and how the innovated, risked, and tried different things in those years. What a great post, Nate. Thanks for bringing all this to light. The early history of Amazon’s efforts in the ebook market really says a lot about what’s missing and wanted in book publishing and retailing–at least in those quarters that bemoan Amazon’s successes. There’s a definite “fish or cut bait” lesson here. I bought my first Microsoft Reader ebooks from Amazon in July 2002 to be read on. PDA. As I remember, it was a few hours after buying that the download was available. I bought a few more after that but at the time Fictionwise was the better option for ebooks. Also, the sales history for these ebooks are gone from my account. I can still the first books I bought in 1997, but the ebook sales exist only in my memory. And BTW, the last time I bitched about credit I decided my complaint was in appropriate so I deleted it. I’m not planning to make similar comments in the future. But I gave you a hat tip anyway.